MONTREAL (Reuters) - SNC Lavalin Group's chief executive said on Friday the company is looking at ways to protect its business in the event it loses a corruption trial that has created a political crisis for Canadian Prime Minister Justin Trudeau. 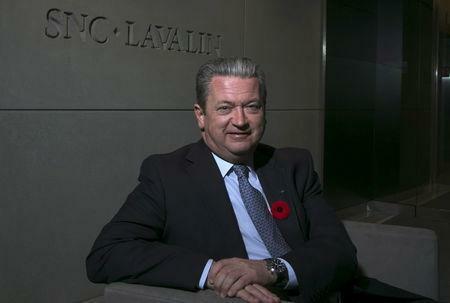 An SNC-Lavalin board subcommittee is weighing the construction and engineering company's options as it takes "steps to minimize the effect of any potential sort of bad outcome in a few years' time," chief executive Neil Bruce told Reuters in an interview. At the affair's center is a request by SNC-Lavalin for a remediation agreement that would have enabled it to avoid a court case which, if lost, would block it from federal government contracts for a decade. SNC-Lavalin is facing fraud and corruption charges related to allegations that former executives paid bribes to win contracts in Libya under Muammar Gaddafi’s regime, which fell in 2011. "We don’t want to be reacting too late or not early enough if the worst came to the worst," he said. "We’ve got to be prudent and make sure that we position the company." Being blocked from federal contracts would raise the threat of job cuts among the company's Canadian workforce of 9,000. "If we were in a position where for whatever reason we couldn't do work with a certain customer or in a certain country then we would plan all of that and make sure that our business development efforts and the work we were chasing and hopefully winning didn't fall into that category. That's part of the mitigation plan." Bruce said the political issue engulfing the Liberals has "very little to do" with the Montreal-based company whose backlog of about C$15 billion ($11.17 billion) is expected to rise during the first quarter. But politics impacted SNC's ability to win new work in Saudi Arabia in December and January, amid tense relations between Riyadh and Ottawa. Saudi Arabia froze new trade with Ottawa in August after Canada demanded the release of jailed rights activists. "Generally we would expect to win sometimes one in two, sometimes one in three," he said. "And that actually went down to zero in a couple of areas." While the dispute has not impacted current contracts underway in Saudi Arabia, Bruce said SNC's backlog in the country would taper off toward the end of the year if it didn't win any new contracts in 2019.